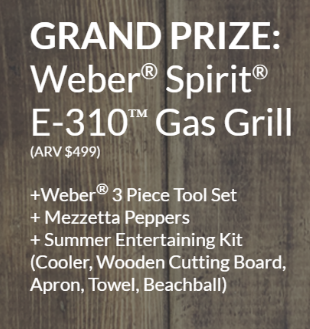 Mezzetta’s 2016 Summer Sweepstakes – Win a Weber Grill & more! Win a Weber Grill & more! ENTER SWEEPSTAKES HERE – Mezetta Sweepstakes page. ENTRY LIMIT – Limit one (1) entry every 24 hours, per person/email address/household, regardless of method of entry. ELIGIBILITY – Mezzetta’s 2016 Summer Sweepstakes is open to legal residents of the fifty (50) United States and the District of Columbia who are at least eighteen (18) years old at the time of entry. SWEEPSTAKES ENTRY PERIOD – The Sweepstakes begins on May 16, 2016 at 12:00 AM PST and ends on July 15, 2016 at 11:59 PM PST.